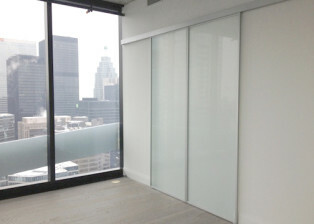 Sliding barn doors are a great way to partition off one area from another. 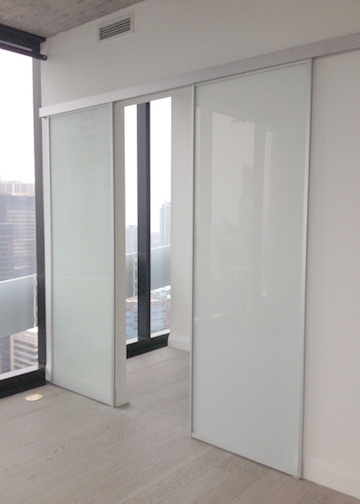 In this condominium project, our customer was looking to divide a bedroom area from the living room area. With square footage at a premium, an innovative solution was needed. Traditional hinged swinging doors were considered at first by the client however much more dead space would be required to allow the doors to swing open and closed (known as protrusion). Sliding barn doors were found to be a better fit for this application. Since these doors slide along a wall, there is virtually no protrusion into the bedroom or living room. By eliminating the need to leave space for swinging doors to open and close, more options for optimal furniture placement were created in the space. As the condo unit had a contemporary aesthetic, Komandor’s aluminum framed Studio sliding barn door system was chosen with a frosted glass insert. The frosted glass is a laminated safety product which means that the frosted finish, as well as the smooth glass surface is identical on the front and back side. 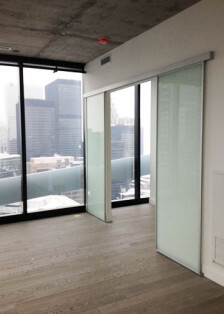 The frosted effect gives privacy while at the same time allowing for light transmission between both rooms of the home. 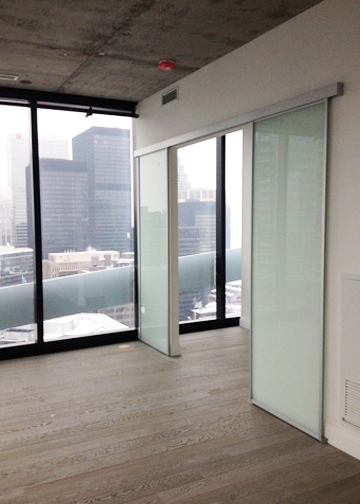 For clients who require more privacy, laminated panel products are available for the inserts. Sliding barn doors from Komandor have the option to have the track system mounted to the wall (as in this case) or the ceiling above. Since sliding barn doors hang from a top track, there is no need to have a bottom track. As well, doors have the option to slide along the wall or with proper pre-construction preparation, doors can be set up as pocket doors. Please Contact Us if you are interested in our sliding barn door systems or would like more information on other Komandor products.